If you want to achieve real success in Scottish salmon fishing you need to start looking at the river like a big hungry dog otter! I don't mean for one minute you should grow thick whiskers and practice holding your breath in the bath however there's a big advantage in becoming a riverbank 'possibility thinker' and sub surface clairvoyant! The most valuable salmon fishing kit you'll ever use on any Scottish salmon riverbank is your subconscious mind and your good old reliable gut feelings. When you've spent enough time looking at salmon rivers like an otter has you'll have a visual blueprint of 'where to search' well and truly embedded in your mind that doesn't require a second thought. This experience will keep your fly swim time optimised whether you're actually aware of it or not. Optimised salmon fly swim time plays a big part in success once you've mastered the important basic salmon fishing & riverbank movement skills. Being tuned in enough to listen & act on the most gentle 'nudges' in the back of your mind can often be the difference between a blank day or a salmon! Never look at a salmon river and assume you've no sub surface audience as that will very seldom be the case. Just because salmon aren't showing as they sometimes do or fish haven't been caught matters not a jot. This is a business of 'windows of opportunity' which appear and disappear throughout the duration of all salmon fishing days like moving targets on a shooting range. If your analysis of the pools you're fishing has identified and is covering the likely salmon holding areas properly it's your fly that going to get the attention when these opportunities arise. Over the decades I've seen angler's heads go down too quickly on numerous occasions to a point where they've virtually given up and usually just before another fisher hooks and lands a perfect fish. Get yourself properly into the 'vibe of the river' and recognise quickly that you're dealing with a magnificent ever changing & ever adjusting slice of Mother Nature's finest creation. 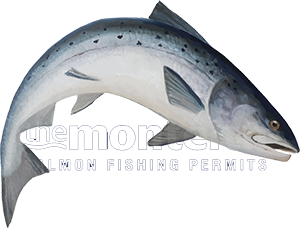 Watch it closely and all the subtleties that go hand in hand with all salmon fishing days and watch for the links between the slightest of natural adjustments and how salmon often react. This pursuit goes way deeper than most salmon fishers could ever imagine and real success is born out of 'being at one' with the river and all her glorious magnificence. All of the late Scottish ghillie legends I was fortunate to meet as a boy were hugely into Mother Nature and their success with salmon was simply a bi-product of that union. Tuning into the salmon river is very important and only time spent on the salmon river will truly develop this skill. Having the ability to scan for the likely taking or holding areas of a salmon pool will again come with time but whatever you do don't blow your chances of success by letting the underworld sense you! Getting your pool approach just right even on big salmon rivers like the Tay is important as chances to score on any salmon river are seldom plentiful. Don't cast a shadow or walk right up the side of the pool you're about to fish back down through. See things as others will see you and that includes your silvery quarry! The first thing a salmon should ever sense is the presence of your fly and nothing else followed by the eventual nearing of your landing net!